...A Prowler body will cost you only £1250. Just find yourself an MOT-failed Beetle. People who buy Lamborghini Aventadors and then drive them backwards and forwards outside Harrods are seeking attention. Fine, but they’ve got it wrong. If you want to rack up a serious eyeball count, you need a beach buggy. Furthermore, if people are saying nice things about your choice of motor, you can’t hear them in an Aventador. You can in a beach buggy: I know because a lot of people have been complimenting me on my choice of wheels. And shirt. Back in 1970, the Sprinkle family moved to the UK from the US and sent their two sons to the school I was at. Along with the boys, Mr and Mrs Sprinkle brought with them their daughter Susanne, who made a major impression on me, and their beach buggy. I still have a vague memory of Susanne, but a very accurate mental picture of the buggy. Metalflake purple, big chrome roll-over bar, huge tyres and a loud exhaust. We all had Hot Wheels beach buggies but one in full size, in our school car park among Morris Minors and Ford Anglias, was unbelievable. Beach buggies were big in California but we hadn’t seen one in Woking. That would change within a year or so as these minimalist machines caught on in Britain. I don’t know what make of beach buggy the Sprinkles owned but it’s very similar to the one I’m driving now. 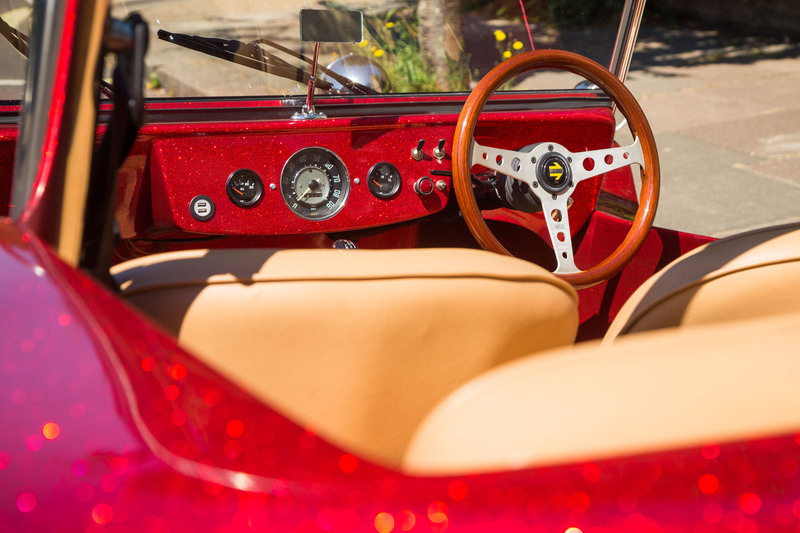 This red metalflake marvel is owned by James May, who has had it restored after it was on the Grand Tour programme. My working world these days is full of infotainment, smartphone mirroring and lots of technology to do with electric cars that I don’t fully understand. It’s going to give me a great deal of pleasure to describe to you the technical spec of May’s buggy. Proper old-school stuff. 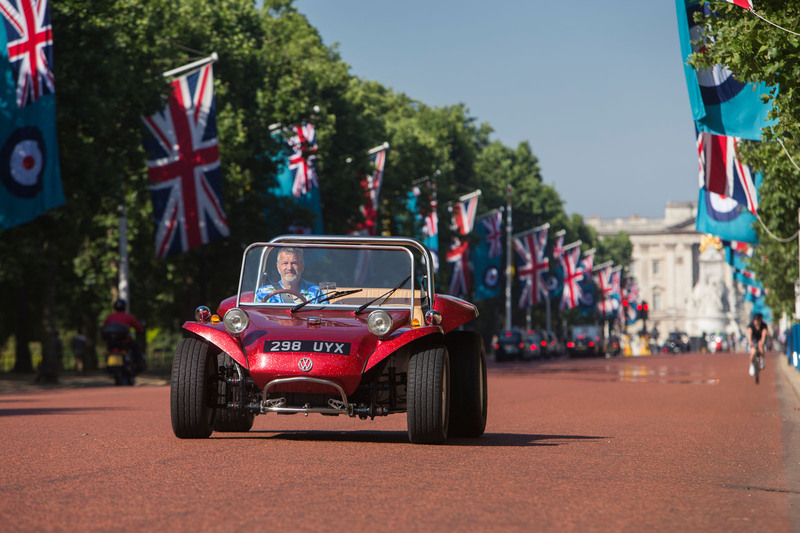 The glassfibre body is a Prowler, which is essentially a copy of a GP body, which, as all beach buggies have been, is a copy of the original Meyers Manx. The body is ultra simple, with no doors or openings, and literally bolts to a Volkswagen Beetle chassis. Unless you’re building a long-wheelbase buggy, which doesn’t look quite right, you have to cut and shut the floorpan. This buggy was built using a brand-new body by a company in Birmingham called Kingfisher Kustoms, which is run by lifetime buggy enthusiast Dave Fisher. Built to stand abuse from motoring TV stars, it uses an independent rear suspension from a 1302 ‘Super Beetle’, CV joints from a Type 2 van (they’re stronger and allow more travel) and rear hubs from a VW Type 181 ‘Thing’. At the front, there are disc brakes from a standard Beetle but with four-to-five stud adaptors. The tyres are suitably podgy 215/60 R15s at the front and 275/50 R15s rear. The engine is bored out to 1776cc, has big-valve twin-port heads, each of which wears a Weber 40 IDF carb, and breathes out through Supertapp mufflers. The cam is an Engle 110, the pistons by Mahle and the crankshaft standard VW. To top it off, the whole lot has been lightened and balanced. It hasn’t been on the dyno but the output is guessed to be about 100bhp. The car hasn’t been on the scales, either, but I’d guess at no more than 650kg. It feels very light when you push it around and it feels light to drive. Now, I’m not claiming Lotus- Elise-like handling for the buggy but it feels fabulously light on its feet, with light and direct steering, a ride that’s good by modern standards and acceleration that is probably lousy against a watch but feels very sprightly through the trousers. The motor is torquey, with great throttle response once it’s warmed up. But where’s the beach? I haven’t looked into it but I suspect that finding an expanse of sand on which the car could live up to its name is very difficult unless you live in Scotland or near Pendine Sands in Wales. Churning up sand is not environmentally friendly. It’s the same problem that owners of Ariel’s Nomad must have: where to use it. Actually, the Nomad is rather like a modern beach buggy. Simple, minimalist, light and fun. Removed from modern, highly complex supercars that have performance that’s unaccessible on the road. Lack of sand isn’t a problem. 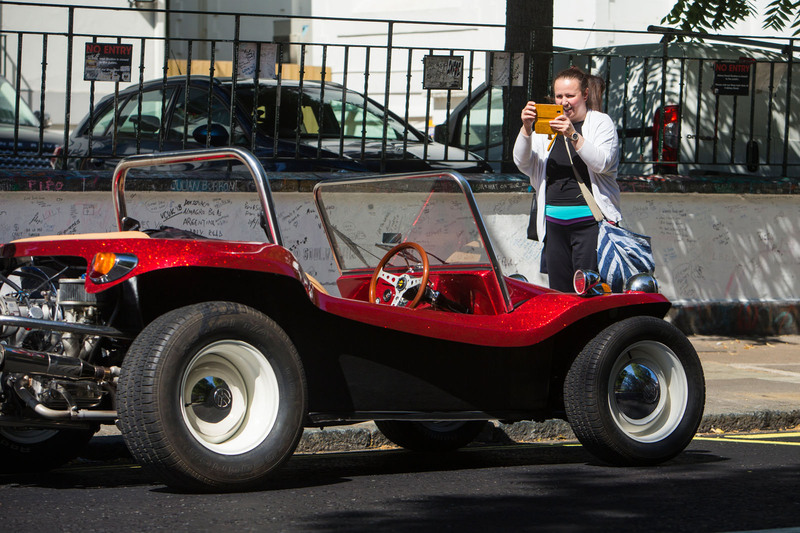 A beach buggy is fun anywhere, even in central London. Small, squat, nimble and easy to literally hop in and out of, it’s the perfect urban transport. Especially if it’s sunny. Steve McQueen might be more famous for driving a Mustang in Bullitt, but don’t forget The Thomas Crown Affair, in which McQueen thrashed around the dunes in a beach buggy with Faye Dunaway in the passenger seat. 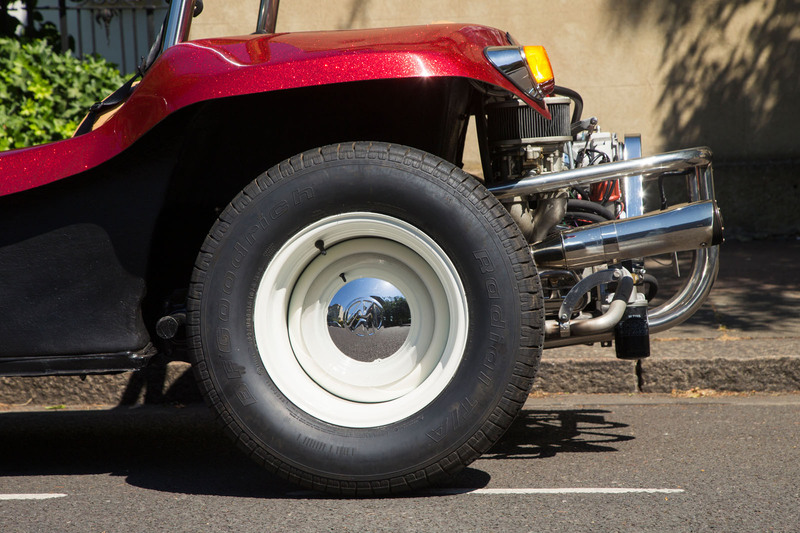 The father of the beach buggy is Bruce Meyers, a surfer, engineer and artist who used his experience in building GRP boats to create the first Meyers Manx buggy in 1964. He’s still going strong, aged 92. Elvis Presley drove a Meyers Manx in his 1968 Live A Little, Love A Little film. Toy company AMT built a model of the car; just one of dozens of buggy models produced in the 1960s and 1970s. I'd hazard a guess that a professional restoration like James May's car shown would cost nearer £10,000 than £1250, added to which the supply of usable donor Beetles must be getting a bit scarce. Instead, you could buy a Lotus Elise, which has a roof of sorts and the engine more or less in the right place. So where does the mysterious £1250 come from? The article does not mention cost. A clean used Buggy currently fetches around the £5000 mark, and a conversion would hardly cost much less, depending on who does the work and running about. Good to try an electric version, though you'd need to waterproof it for beach driving. Just looked it up, and for your £1250 you get an unpainted GRP bodyshell. Hats off to James May....I would say he has specc'd this beautifully. There is no point in putting Porsche 6 cylinder engines in a Buggy, and engine wise I think he has given this one enough power to keep it fun. I even love the wheels with hubcaps, although I would be tempted by Wolfrace items or American Racing Torque Thrusts of similar dimensions. .....either none of the guages (including the speedo) work .....or the blurred background has been photoshopped! The carbs, without linkages, filters or choke kit are about 500 quid the pair. MOT failed beetles usually rot the floor out, sometimes the front beam and/or the front clip, that's the bit the beam hangs off. The brakes are usually shagged out too. The engine will probably have so much end float the crank case halves will be scrap. Your 1250 is merely the entry fee into the party. Look at it in the same way you would a Nigerian prince, 1250 sent off in an envelope and your troubles begin. I've done a bit of this buggying about before, I love it and loath it in equal measure. Don't get tempted unless you know what you're getting into and the divorce is finalised. If it's got wheels and an engine, I'm interested. No, it won’t see a Beach, but that doesn’t matter, certainly won’t be on a Beach in Scotland, if it makes others smile on a dull Day in Blighty that can’t be a bad thing, can it...?